There was a time that I played cook in a cafe we used to own and run. It was called On a Roll. I didn’t like it much. The mornings were very early, usually before sunrise, and the work was repetitive, lots of shredding chicken, lettuce, tomatoes etc for the sandwich bar, roasting joints of beef, making muffins, bagels and pastries and breakfast fry-ups for early birds. I was only 21 at the time and our 2nd chef had just left, leaving us with a business to run but no one to staff the kitchen. I don’t know how or why we thought it was a good idea that I stepped in, but it turns out I did a decent job of it. I created some pretty awesome recipes for chilli con carne, I leaned how to microwave the fluffiest scrambled eggs and I discovered this incredible recipe for Caesar Salad dressing. It was the ’90s after all. I’ve been meaning to share this recipe for a long time. I found it buried in amongst some On a Roll memorabilia. I found the recipe online, about 17 years ago and the print out is stained and faded, the sign of a good recipe. When it comes to assembling your Caesar Salad I don’t want to tell you how you should enjoy your meal. Some people love anchovies, some people like their eggs poached instead of boiled and some like to bulk it up with chicken or bacon. This Caesar dressing is as versatile as a good creamy Ranch dressing. You can serve it poured generously over thick wedges of lettuce or it can be just as amazing served up with a mixed vegetable salad. 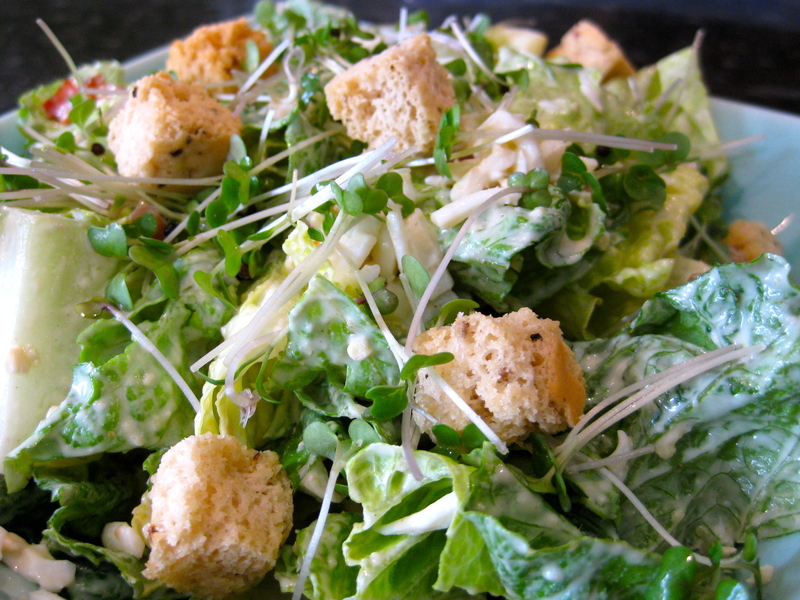 According to the Internet, the original Caesar salad did not contain pieces of anchovy; the slight anchovy flavour came from the Worcestershire sauce and the original recipe comprised whole lettuce leaves, which were meant to be lifted by the stem and eaten with the fingers; coddled eggs; and Italian olive oil. I like to keep it almost as simple with my version because really, the dressing does all the work; plenty of roughly chopped cos lettuce, grated boiled egg, croutons, lightly fried pieces of Prosciutto and I promise you it feels like a meal. 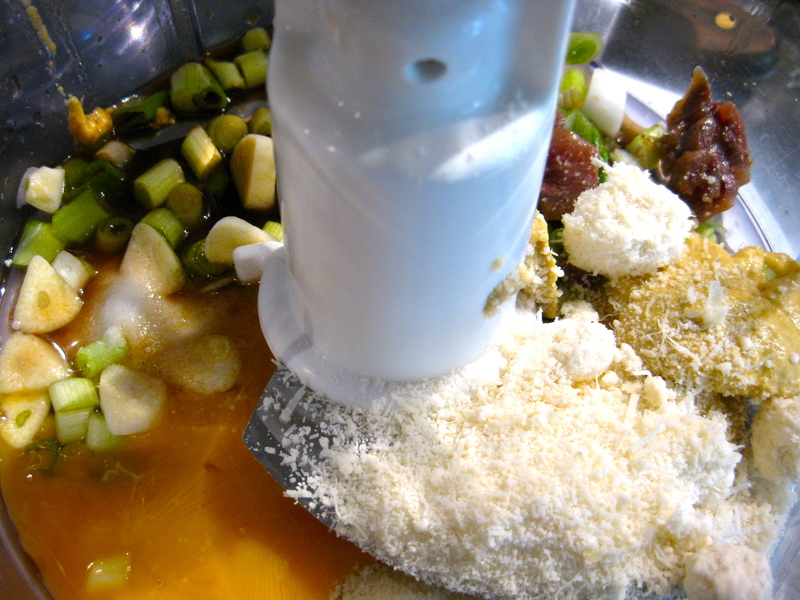 Put all the ingredients but the olive oil and water into a blender or processor and whizz till everything goes smoothish. Drizzle olive oil and water until the dressing thickens. You can use more water if necessary. The dressing will taste very strong but the punch will get diluted once you mix it up with all the salad. You can serve this dressing up with pretty much any kind of salad and it will taste great. The dressing itself will keep in fridge for about 3 days if nicely sealed – remember there’s raw egg in there so don’t be tempted to keep it longer than that.